The Art Deco architectural style is something London does well (think Senate House, the Hoover and Daily Express Buildings, Florin Court). The buildings are beautifully proportioned with strikingly geometrical forms and ornament; the style is timeless. Because of the primacy of good proportion, new builds can look as good as the earlier buildings of the 1920/30s that inspired them. This is the case right now in the Haymarket where the bright new world of St James's Market is opening up. I like the way this new London quarter announces itself: "Founded in 1663, re-founded in 2016". Here is a clearly 2016 development that references the 1920/30s world of art deco, a beautiful building in its own right and one that pays homage to its equally beautiful 1955 art deco predecessor Haymarket House on the opposite side of the street. Thus, in a single well-planned stroke we have a key central London street lifted out of the architectural doldrums of recent decades, establishing both a new West End quarter and a piece of new and most distinguished architecture of which Londoners can be proud for many decades to come. I recently took a walk around some of the other star turns of West End art deco in the company of Yannick Pucci, a celebrated London architectural guide and art deco buff. Yannick manages to be both erudite and concise, describing in a few words the key features of the style he is outlining and its historical context. We started the walk near Leicester Square. This part of the West End is reinventing itself. You don't have to be in the habit of attending film premieres to know that the whole area is becoming well-brushed red carpet land. Time flashed by as we saw the Vue Cinema, the famous Odeon (its highly polished black granite shining in the sunshine) and the smaller art deco buildings around Chinatown. 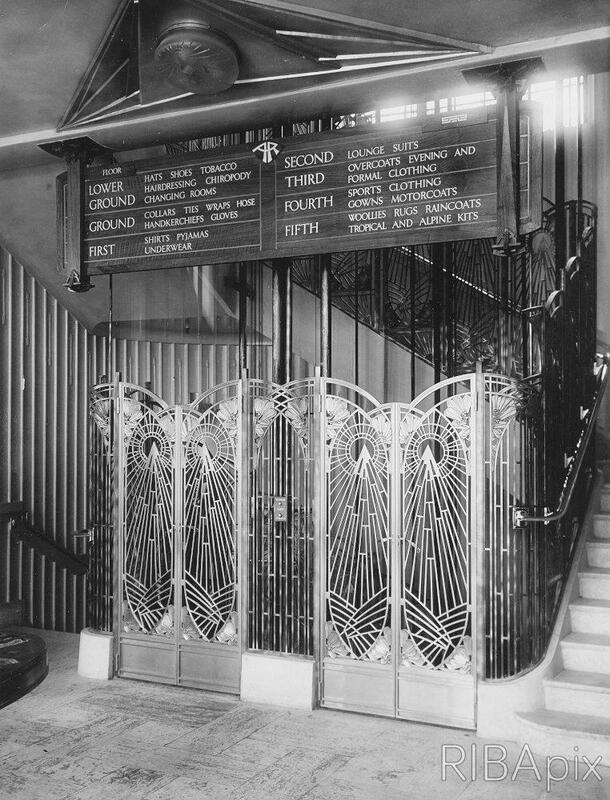 This was followed by art deco in Jermyn Street, including the stately Simpson Piccadilly building, front and back, of Waterstone's Piccadilly. We then walked north to Regent Street and it was here that Yannick produced his big surprise: the art deco interior hidden away in Superdry. The building was previously the flagship store of Austin Reed. Most of its original interior has, alas, gone. However, the basement still has the original art deco fixtures and fittings. In its previous life it housed the posh Austin Reed barbers where men could have wet shaves, massages, and haircuts as well as visit the changing rooms to spruce themselves up before a night on the town. 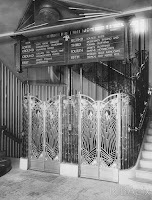 Yannick had brought along archive pictures of what the original interior looked like, including a state of the art metal lift gates designed by Morris Singer in 1926 (see archive pic). Anyone wanting to view this destroyed marvel should go to the relevant RIBA site and wonder loudly why it exists in archive but not in reality. It is the sort of functional piece of decorative art that has art lovers salivating as they board the train or the plane to Miami, Nancy, Napier (New Zealand) or Brussels. Who knows what became of it. Yannick Pucci's next Art Deco in the West End walks also cover Bloomsbury, Strand, Fitzrovia, Mayfair, St James’s, Piccadilly, Soho, Knightsbridge, Belgravia, Kensington, Holland Park. Go to Eventbrite to book. Note: The term art deco seems to have come, via an unknown journalist's need to shorten their copy and find a catchy headline, from Exposition Internationale des Artes Decoratifs et Industriel. The exhibition took place in Paris in 1925 and was an architectural game changer in every respect. Further reading: Art Deco in London, Arnold Schwartzman, Palazzo Editions, 2010.